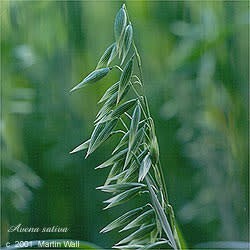 The genus name Avena is Latin for "nourishing." The common name oat derives from the Old English term for the grain, a-te. Oat, native to Europe, Asia, and northern Africa but naturalized in North America, is an annual grass that grows freely in the wild along roadsides and in disturbed areas. It also is cultivated as a field crop. Its hollow stems grow to about 4 feet in height. The leaves are long, broad, and slightly hairy. Two or three florets form small, elliptical, drooping spikelets in loose, open panicles on horizontal branches; the flowers are hermaphroditic. In the garden, oats enjoy full sun, soil that is rich in organic matter, and moderate amounts of water; they will tolerate drought. Planted en masse, they will prevent soil erosion. When wildcrafting, avoid collecting fuzzy or blackish oat grains, which may be contaminated with ergot. With its high silicon content, oat helps nourish the skin, nails, teeth, bones, and hair. It also builds the blood, relaxes the nerves, and strengthens the nervous system, making tactile sensations more pleasurable. It even supports the elasticity of blood vessels. Its seed and stem are used in the treatment of addiction, alcoholism, anxiety, attention deficit disorder, bone cancer, broken bones, colds (chronic), constipation, convalescence, convulsions, Crohn's disease, debility, depression, diabetes, dyspepsia, emotional distress, erectile dysfunction, exhaustion, gout, headache (stress related), hemorrhoids, incontinence, infertility (male and female), insomnia, low libido, lupus, menopause symptoms, multiple sclerosis, nervous breakdown, nervousness, osteoporosis, paralysis, post-traumatic stress, rheumatism, rickets, schizophrenia, sciatica, shingles, stress, ulcers, varicose veins, and withdrawal symptoms (from tobacco, drugs, or alcohol). It is also used to facilitate recovery from childbirth. When consumed regularly, oats can lower cholesterol levels. Topically, oat can be used as a bath herb, lotion, salve, or poultice to soften skin and relieve the itchiness of eczema, hives, rheumatism, and neuralgia. As a compress, oat can help heal stitches and relieve the pain of kidney stones. The oat grain is a common food staple and is high in protein. It has a light, mild, creamy flavor. The grain can also be sprouted. An edible oil can be pressed from the seed. The seeds are sometimes roasted and used as a coffee substitute. 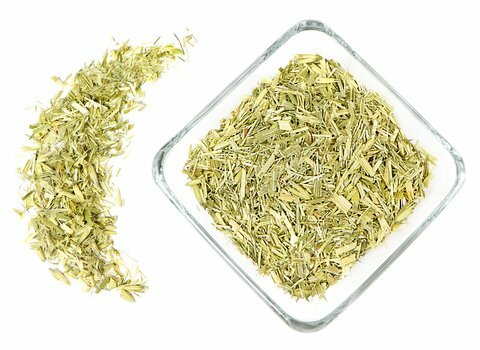 Oat tea has a pleasant, mild, slightly sweet flavor. A tea made from oat seed or straw mixed with nettles is a particularly mineral-rich brew. Oat husks are not only used to stuff bedding but are said to have a sedative effect. The straw can be used to make thatching, paper, and mulch. The hulls are also used to make construction boards and filters in the brewing industry. The hulls of oats are used in the production of furfural, a chemical used to make many industrial products such as nylon, glues, rubber tread, and lubricating oils. Oatstraw tea can be sprayed in the garden to inhibit striped cucumber beetle infestation. Those with gluten allergies should use oats with caution.